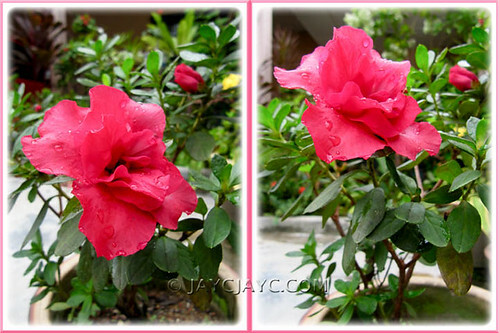 December 2010: our garden delights! So sweet and so rosy! This showy rose-pink azalea is the closest that we can likened to a red rose in our garden and definitely a lovely alternative! Reminds us of the lovely fragrant roses that we grew during our early years of wedded bliss that were abandoned when they became frequently diseased and had to be treated with pesticides that I’m allergic to. 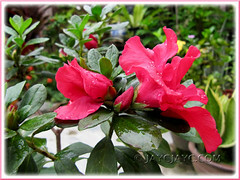 Our Azalea beauty was blooming its head off last month to lead the Christmas festive mood in our little tropical paradise and its buds are still bursting forth till today! How delightfully cheerful! A beautiful dwarf plant that had been with us way back since early 2007! We’re rather surprised that this potted holiday plant that we received as a gift for the Chinese Lunar New Year has been able to flourish all these years. 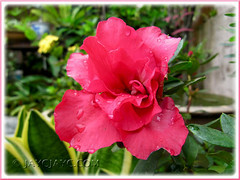 Learn more of the Indoor Azalea, its profile, culture and propagation here. 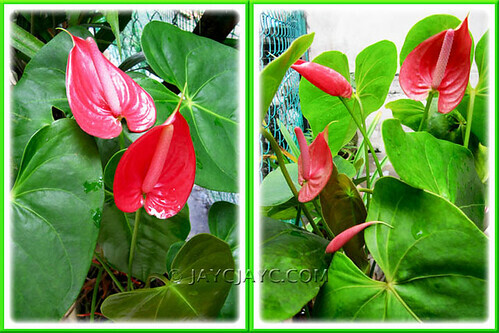 Anthuriums – another garden gift in December 2010 that surprised us too. Truly marvelous as it was the first time that we got to enjoy so many flowers blooming altogether since we propagated them by stem cuttings in two pots in March 2009. They seem to enjoy the sunny location at the backyard. Such timely garden delights for the season of Christmas! Rewarding us so for our tender loving care!